I’ve introduced the free Gimpel3D manual 2D to 3D stereo conversion software here on the blog back in 2011, and now the author has made it an open source software by releasing the code of the project on Sourceforge. Gimpel3D is a free application that can help you convert a single 2D image or image sequence into stereoscopic 3D written by René Gimpel. The conversion to 3D is manual and the software only assists you, so do not expect automation like with an 2D to 3D autoconversion solutions that do everything with just a click of a button, with Gimpel3D however you can get much better results. 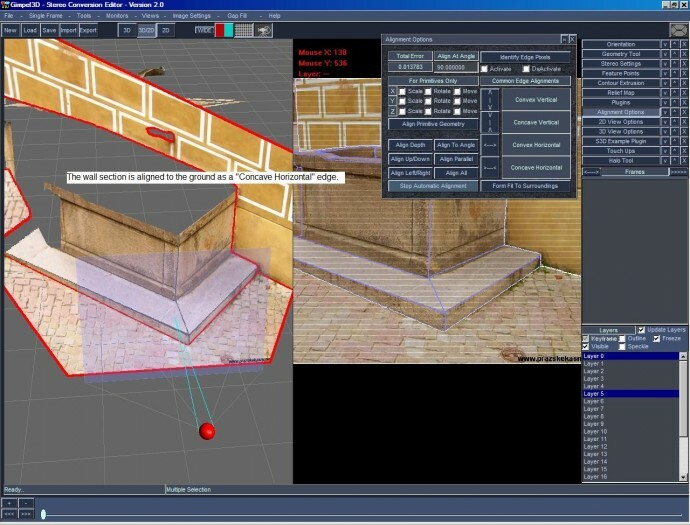 Since the original freeware release of Gimpel3D, many of the ideas presented in the software have become standard features in commercial software and as a result the author of the program has decided that there is no significant advantage to continue developing it as a stand-alone proprietary solution, although the codebase makes a nice platform for future research and experimentation. René Gimpel has released all source code for G3D under the GPL so that other stereo researchers, hobbyists, and/or professionals can build upon his existing work, and integrate/test new capabilities using the projective modeling environment. Here is a short list of the announced movie titles for release in 2014 and which ones will be shot in 3D and which will be converted to 3D in post production according to the website Real or Fake 3D. 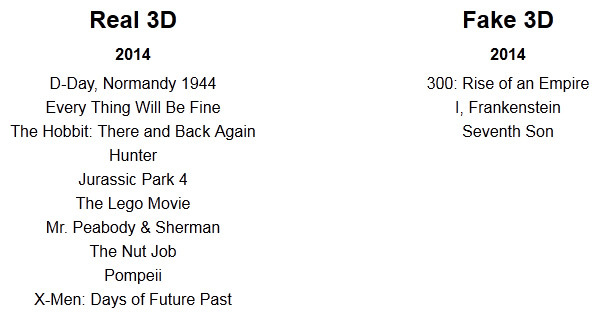 The 3D movies released (and to be released) this year that were shot in 3D were more as a number than the ones that were converted to 3D in post, even though some of the most anticipated movies are using 2D to 3D conversion. And so far this trend will seem to continue in 2014 as well, but you should be aware that even if a movie was shot in 3D does not mean that it will be a great one and even if 2D to 3D conversion is used if made well and properly used the movie might end up good. In general however watching stereoscopic 3D movies that were shot in 3D and not converted in post do provide better experience than the ones that have been converted to 3D. 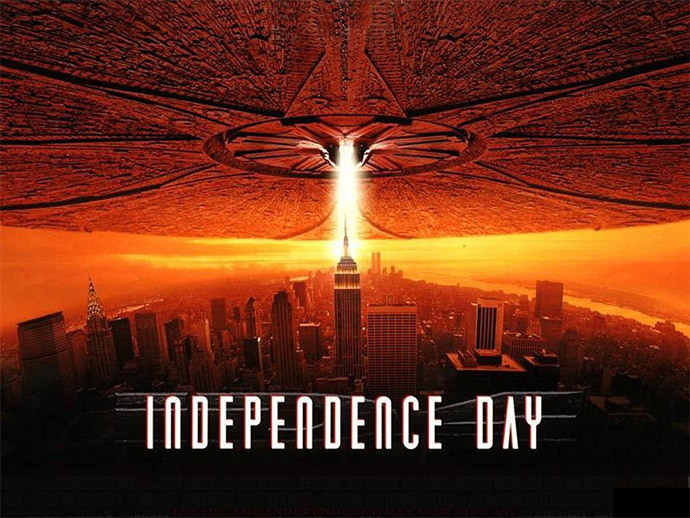 20th Century Fox will apparently be preparing a 3D conversion for a re-release of the movie Independence Day scheduled for release on 4th of July 2013. Supposedly it will be a top quality conversion supervised by Roland Emmerich (the director of the movie) and the conversion itself will be made by the same company that worked on the 3D conversion of James Cameron’s Titanic into 3D… though still a 3D conversion. You can safely assume that Fox deciding to work with the same company that converted Titanic in 3D is after the really big success of the 3D conversion of Titanic, resulting in enormous revenue from the 3D version of the movie. But you should not forget that with these hit movies from the not so distant past there is also a serious number of viewers returning to the movie theaters not because of the 3D, but because of willing to experience the movies on the big screen again or because they haven’t seen them when they were originally released. But before releasing Independence Day 3D Twentieth Century Fox will have another go at the 3D conversion with the movie I, Robot though this one will be a Blu-ray 3D release only. The conversion of the I, Robot however will be done using a new 2D-to-3D conversion process developed by JVC that promises good results with much less time and work, meaning lower costs for the conversion. And if you are re-releasing a 2D movie only on Blu-ray 3D it would not seem a very good idea to prepare an $18 million budget for the conversion process like Cameron did with Titanic as you may have serious trouble covering even the cost, let alone to have profit from the movie. And big movie studios thing first about the profit they can get when making decisions about re-releasing old movies converted into 3D, but we’ll have to wait and see how good JVC’s conversion process will turn out to be. We already now it will be cheaper and quicker, but it is also important how good will be the quality of the conversion compared to the longer and more expensive conversions done. And no matter if you are willing to watch any of these 3D conversions, or if you are watching a movie shot in 3D, the important thing is that the 3D effect is there not just to impress you with some cheap tricks, but instead to be used as a tool to tell the story better. Obviously this is harder to do when converting a 2D movie into 3D, but it is not impossible… a good 3D movie is not good just because of well used 3D effects, this is just one of the components.